This weekend, the University of Tennessee plays the University of Alabama in a football game, and this is the one I look forward to the most. Younger fans may think of other games as bigger, but, for me, nothing is bigger than when these two teams get together. My dad started taking me to Tennessee games when I was 6 years old, and I have been to every Tennessee/Alabama game since then. There have been a lot of wins. There have been a lot of losses. There has also been a lot of memories. When I was a kid, it was always me, my dad and my grandfather, who we called Daddy J. Most times Larry would be with us. You’ve read about him before. My dad would drive while Daddy J sat in the passenger seat tugging on a big cigar. Being in the backseat, I would lean up to hear the adult conversations that were going on. Obviously, we went to Neyland Stadium all of the time, so I considered it special to attend a game at Legion Field in Birmingham. For the younger folks, that’s where Alabama used to play all of their home games. If the timing was right, then we would eat at All Steak in Cullman. Once in Birmingham, we would park in someone’s yard and walk to the stadium, where they had the greatest hot dogs I have ever eaten. Legion Field was different from a lot of stadiums because it had a walkway around the field. Fans could go up to the fence and get close to the players and coaches. I can remember my dad telling me about Bear Bryant and pointing to the man standing under the goalpost. He had a program rolled up in one hand and a cigarette hanging in the other one. Of course, he always had on the houndstooth hat. These days houndstooth has become a fashion statement in Alabama, but I always wonder how many of the people wearing it actually saw Bear Bryant coach a game. All of that was cool, but it has always been about more. On Saturday, I will attend my 39th game between these teams. I have forgotten the details of a lot of them, but a few games stand out. 1982 – Tennessee came into the game in full rebuilding mode under Johnny Majors. Alabama came into the game ranked second in the nation and with eleven straight wins over Tennessee. Shocking everyone, Tennessee intercepted a pass in the end zone to preserve a 35-28 victory. No one was more shocked than me because it was the first time I saw Tennessee beat Alabama. Honestly, I never thought it would happen. More honestly, I shed a tear or two. We were staying in Gatlinburg that weekend, and I wore orange the rest of the night. As we sat on a street-side bench, people would walk by and say “Go Vols!” Crimson couldn’t be seen anywhere as Tennessee fans celebrated. It turned out to be the last time that Tennessee played against Bear Bryant. He retired at the end of the season and passed away a few weeks later. 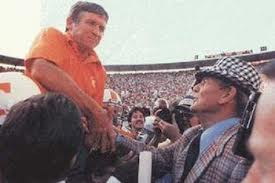 Most Tennessee fans know the photograph of Johnny Majors and Bear Bryant shaking hands after the game. 1983 – The rematch in Birmingham was an offensive explosion. The teams traded blows until Johnny Jones scored on a 66 yard run to make the final score 41-34. It was electric, but things got better. Larry and I snuck into the Tennessee locker room and joined in the celebration. I got wrist bands from Charles Davis, one of Tennessee’s players. However, the best souvenir was a pair of socks from Clyde Duncan. Those socks scored on a long touchdown pass that day, and I wore them to every game for many seasons after. 1985 – This time we didn’t drive to Birmingham. Some people who my dad did business with flew us down on their private jet. On Friday, we toured their factory and had dinner at the fanciest restaurant I had ever been to. We had to wear a coat and tie, which I didn’t have. I had to wear what the restaurant gave me. There was a piano player, and my dad paid money for him to play “Rocky Top.” The other diners were not pleased. The next day, Tennessee, ranked twentieth in the country, won 16-14 as Alabama, ranked fifteenth in the nation, barely missed a last second field goal. The game was full of drama as Tony Robinson, Tennessee’s starting quarterback, went out with a knee injury. The defense had to hold on, and Dale Jones did his part by making an impossible interception. The flight home was quiet because we were the only Tennessee fans on the plane. 1995 – We had learned a couple of months before the game that Daddy J had an inoperable brain tumor. On the morning of the game, I visited him at the hospital and talked to him about football. He probably didn’t understand, but I like to think that he did. After this visit, I met Larry and the other guys to drive to Birmingham for a game between two highly ranked teams. Tennessee was ranked sixth in the polls and was led by Peyton Manning, who was just a sophomore. Alabama came in eleventh in the nation. Like in 1983, Tennessee had not won in a while, and fans were anticipating a change in fortunes. We didn’t wait long as Tennessee scored on the first play and went on to win 41-14. Tennessee found a favorite son and started a seven game winning streak over Alabama. After the game, fans tried to storm the field, but the Birmingham police would have none of it. They brought out the pepper spray and got a few journalists in the process. It was an eventful night, and it was a terrible day. My grandfather passed away that morning after I left the hospital. At the visitation, I told Larry that I wished Daddy J could have seen that game. Larry replied that God let’s us see good things when we are in heaven. I have been to many Tennessee/Alabama games, but those are the ones that I remember most. So, what’s the record between the two teams since I have been going. Tennessee has won 15 games. Alabama has won 22 games. There was one game that didn’t count. You’ll have to ask an Alabama fan about that. This weekend, my friends and I drove to Starkville, Mississippi to watch the University of Tennessee play Mississippi State University in football. The best way to get there from here is to go through Alabama. Yes, Mississippi borders Tennessee but going through another bordering state is the fastest route. Weird, I know. 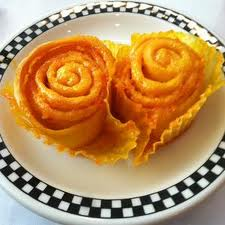 It is also the best route because it allows us to stop in Cullman, Alabama and eat at the All Steak Restaurant, home of the world-famous orange marmalade rolls. We got a lot of looks as we walked in because we were wearing the colors of our team, and that’s not something seen very often in Alabama. An elderly man wearing a crimson University of Alabama shirt took special notice and walked to our table when he was finished eating. He was a nice man who asked us where we were from and what we thought about our team. After a few minutes, we offered him a seat. He introduced himself as Tom Drake, and we spent the lunch hearing the story of his life – one of the most interesting stories I have ever heard. Mr. Drake was born in Cullman County and found his way from there to Chattanooga, where he played football and wrestled in college. After college, he was drafted by the Pittsburgh Steelers, but the army drafted him, as well. In those days, the federal government was more powerful that the NFL, so off to the army he went. 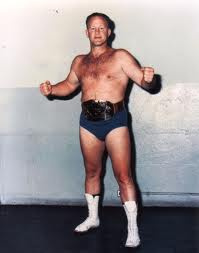 After being honorably discharged, Mr. Drake was hired by Bear Bryant to coach wrestling and football for the Crimson Tide. 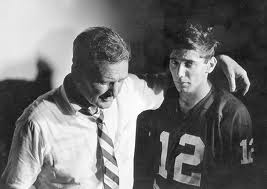 When we asked who was the best player he ever coached, he did not hesitate to say Joe Willie Namath. However, coaching was not his calling, and Mr. Drake went to law school. While still enrolled in school, he won a seat in the state legislature and continued to be elected for 32 years. 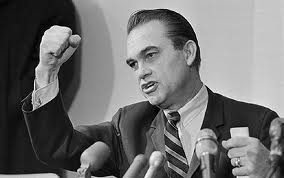 During that time, Mr. Drake served as Speaker of the House and worked closely with infamous governor, George Wallace. In Birmingham, they love the governor. Now, that is an event filled life, but there was more. Mr. Drake spent his spare time as a professional wrestler. Fighting under the name “The Cullman Comet”, Mr. Drake fought against some of the most famous wrestlers of the era. He was later inducted into the International Wrestlers Hall of Fame. With such a wide array of talents and experiences, Mr. Drake made a perfect contestant for What’s My Line?, and he appeared on that show in the 1970s. We barely had time to ask questions as he told story after story. However, his most important story was about his wife. They did everything together, but she died a year ago from brain cancer. He said that he still hasn’t recovered from the loss, and I got the feeling that he just needed someone to talk to. He needed to talk about his life and his memories, and I felt honored that he picked three strangers who were wearing the wrong colors. Mr. Drake said that he is writing a book, and I hope that he finishes it. The book would chronicle a man’s life but also a piece of our history. I was reminded during lunch that history can be found anywhere. It can be found in old documents, but it can also be found in a conversation at the All Steak Restaurant in Cullman, Alabama.